Teens don’t need busywork in their writing assignments. Especially as they near graduation, what students need is an essay writing high school curriculum that hones their thinking and writing skills and builds their confidence. Give your homeschooler the tools he/she needs to write for life with this downloadable pdf e-text! Homeschooling high schoolers need to be able to communicate their thoughts in a clear and persuasive manner. 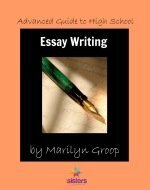 Marilyn Groop’s Advanced Guide to High School Essay Writing ushers high schoolers through skills that will help them defend their Christian faith, write college-ready literary analysis, and (very important) construct a powerful SAT or ACT essay. Advanced Guide to High School Essay Writing gives 10 weeks of self-guided lessons with LOTS of great instruction and NO useless busywork or overwhelming overteaching. Editing checklist and rubrics are included. Give your teen the skills to communicate now, in college, and in life! Click here to view an excerpt from Advanced Guide to High School Essay Writing.